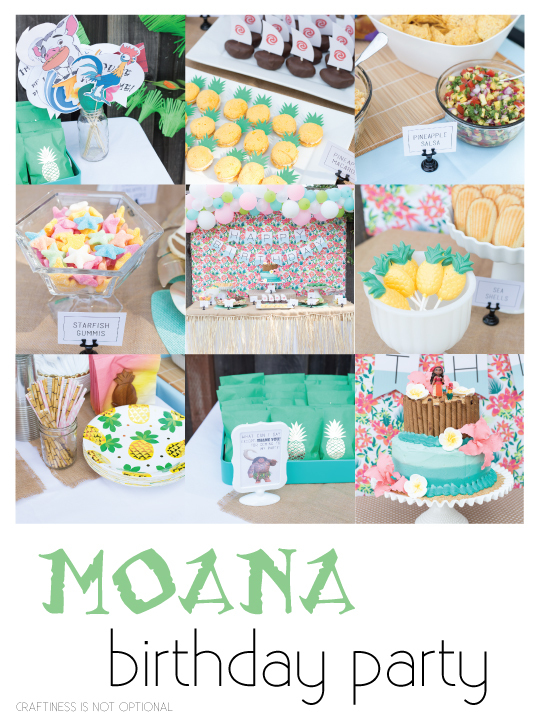 Charlotte was dead set on having a Moana party and since I’ve been wanting to have some sort of luau themed party for years I was completely on board! 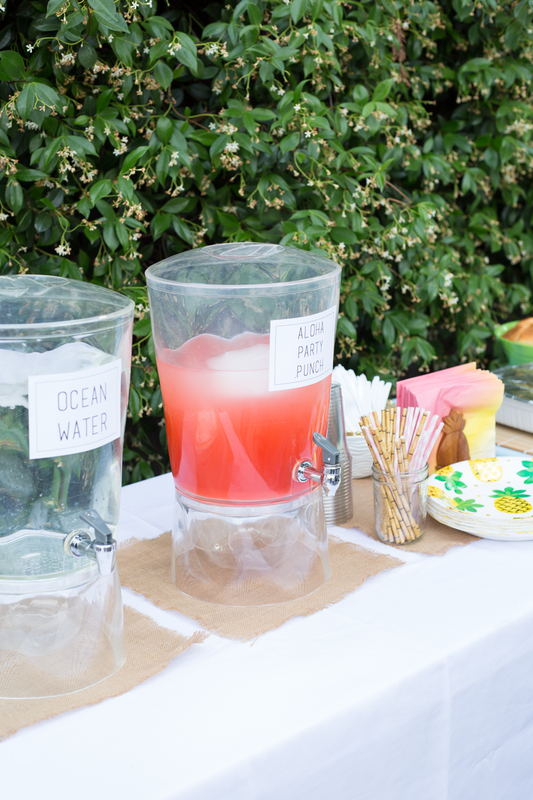 As per usual, I headed to Amazon for a lot of my party supplies, so expect some affiliate links! And thanks in advance if you click on them, they support my party habit! lol! 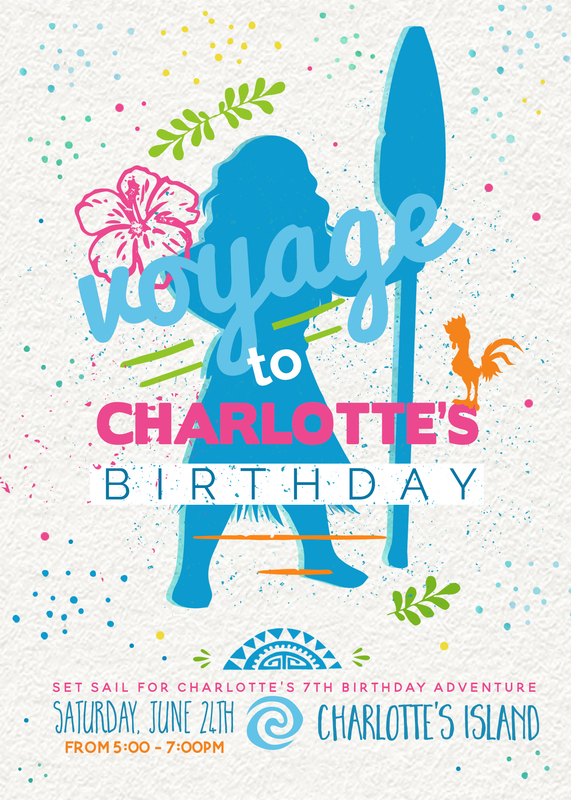 I chose a fuschia, blue, and green theme, and went with this adorable invitation. 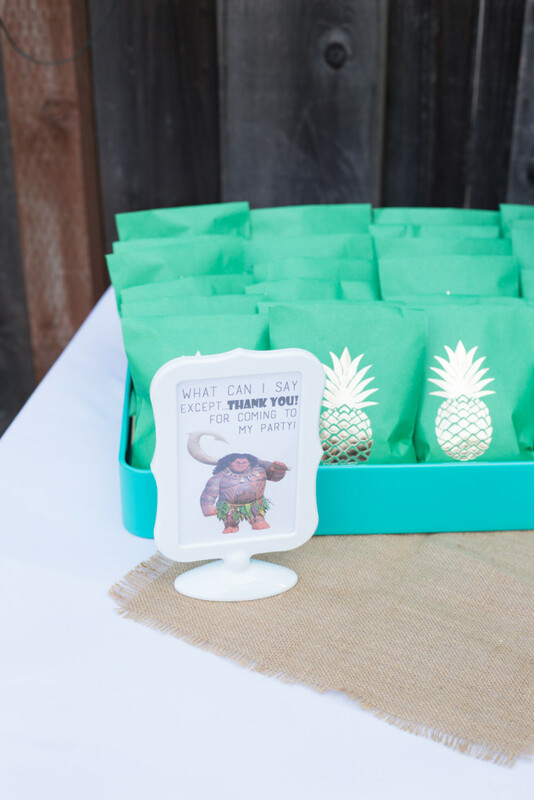 I snagged these adorable green and gold pineapple bags at Marshalls and filled them with pineapple saltwater taffy for the favors. Easy and yummy! 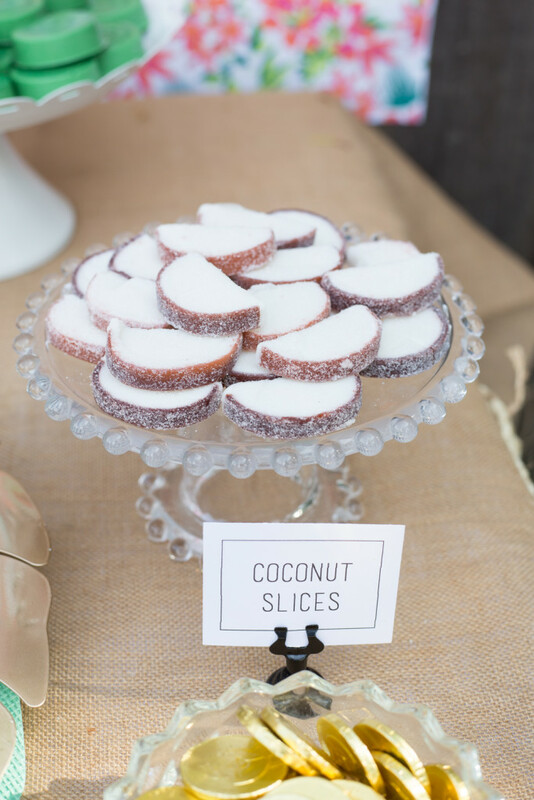 I am all about simple favors the past few years. I’m still a stickler and have to give them out, but I try to make them consumable treats if possible! Jack even helped me fill the favor bags this time with the taffy! It was adorable. If I do say so myself. Which I do. 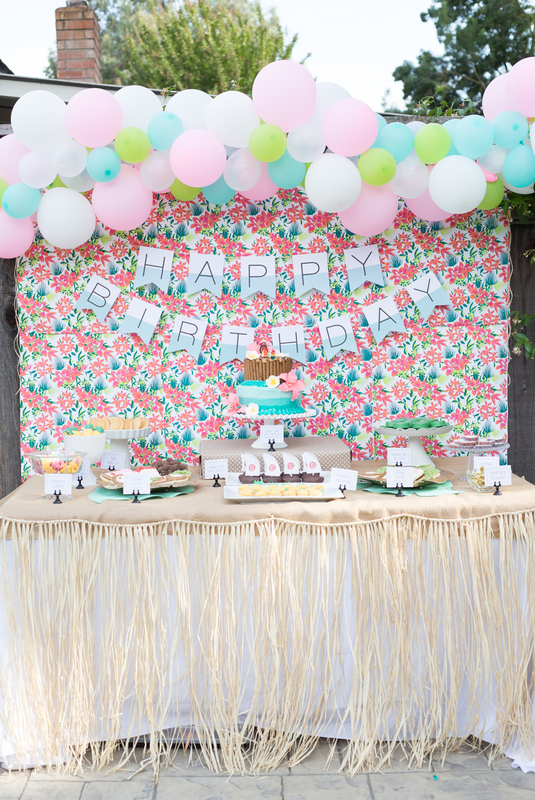 I set up a photo booth area with some green paper swag and floral garlands from target dollar spot this past summer. 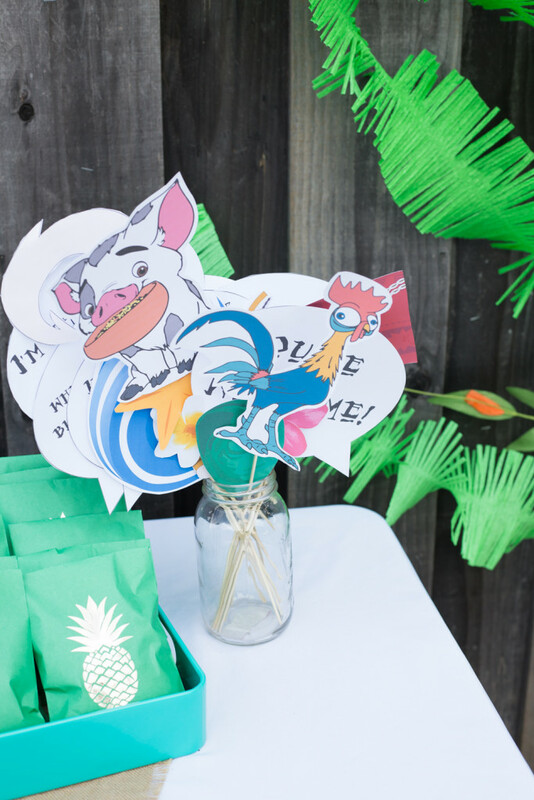 I printed out and had the girls cut these adorable photo booth props. I love to have them help me party prep when possible! I also got some party leis to hand out to guests! It’s not a luau if there’s not leis there! 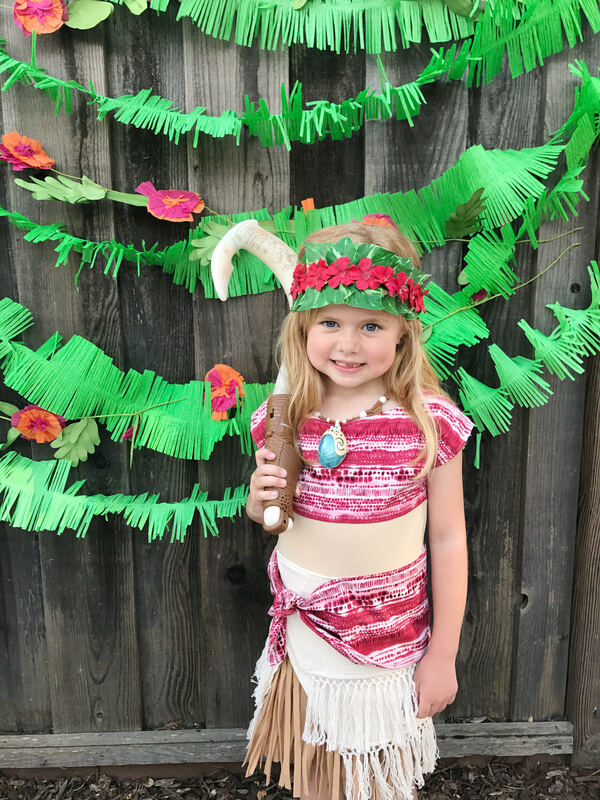 My sister was awesome enough to make Charlotte this MAGICAL Moana dress for the party. Charlotte felt like a queen! I made the headdress and anklet pretty last minute but it turned out super cute! 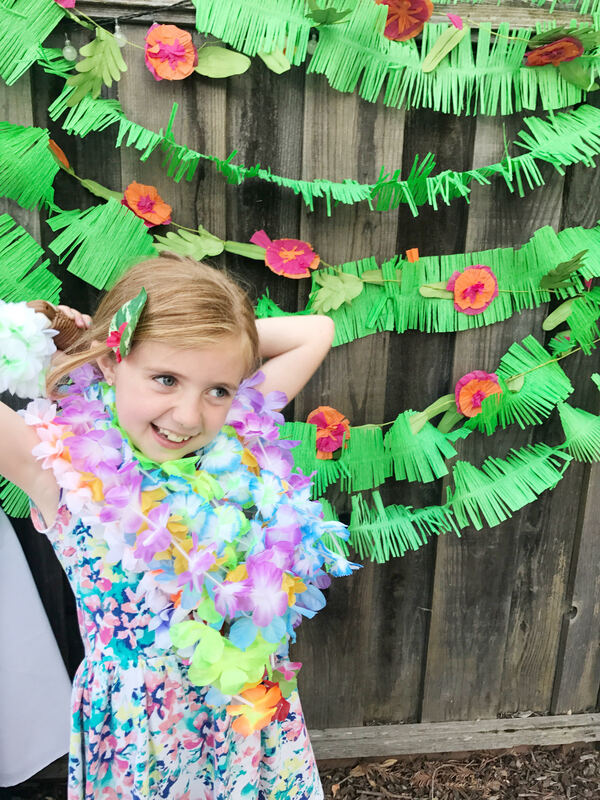 (made it out of thrifted fake florals haha) She ended up getting the heart of te fiti necklace from her Grandma, so she was sporting that most of the party too, and totally looked the part! OK…the table! There is a lot to get to, so let’s start with the backdrop! I got the bright floral paper at Marshalls-it was clearance wrapping paper! So I grabbed two rolls and wallpapered the fence. I designed the happy birthday banner-super simple but I loved how it popped against the florals. The balloon swag…what do you think of that? I followed this tutorial and bought this awesome roll o’ magic to make it with! I bought all the different size and color balloons at Party City-they have a HUGE collection of cool colors and sizes…not an ad lol. I was able to make it the night before, which really helped me not be so stressed the morning of the party. I didn’t have very many pop either! maybe two? 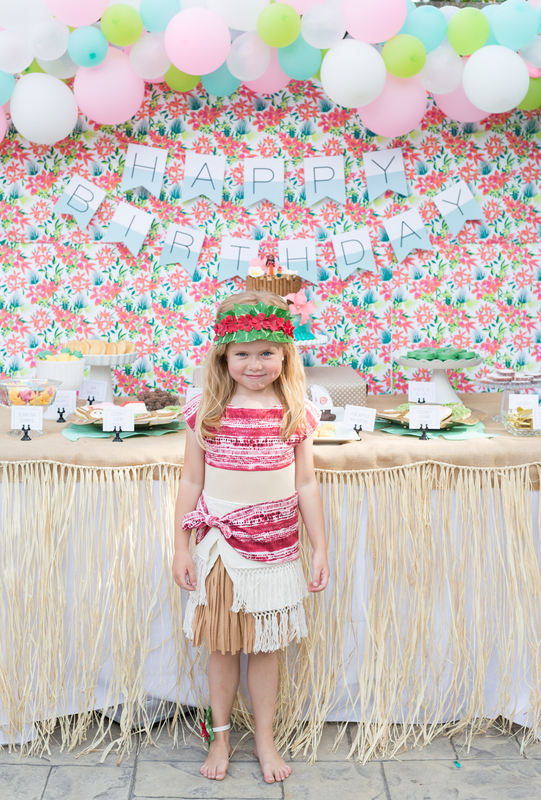 I pulled out my faithful white tablecloth and grabbed this hula table skirt to decorate with. 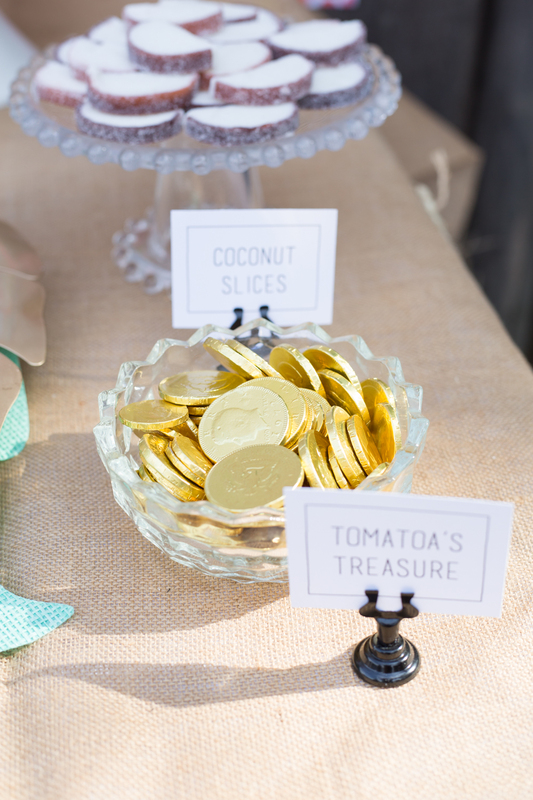 I whipped out my black placecards and made some easy printables for the table-grabbed some gold coins from Hobby Lobby-LOVE! I LOVE how these turned out! 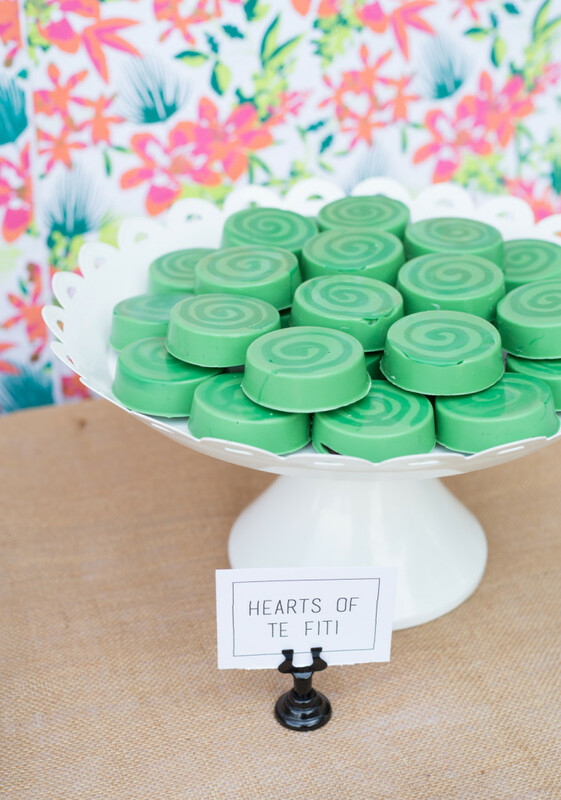 I made (simple) hearts of Te fiti with an oreo mold-I piped the swirl with dark green melting chocolate, then let it set in the freezer for a few minutes, then filled the bottom with lighter green…then you add the oreo in and add more green chocolate on top. Easy and ADORABLE if I do say so myself! 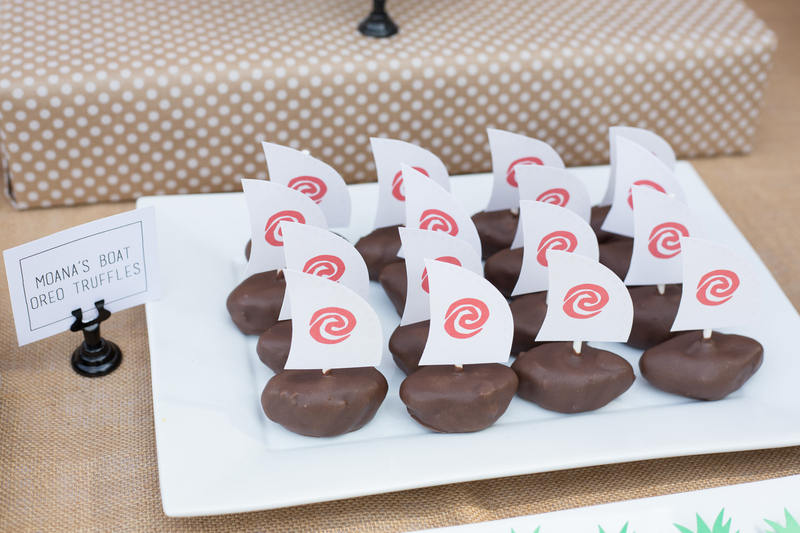 I made these little oreo truffle sailboats by shaping the little boats and dipping them in chocolate-and I designed these little flags for you to download, printed them out, and glued them to the lollipop sticks I used. 🙂 love these guys! I also had a bit of a fail with pineapple macarons, but I served them anyways, lol! 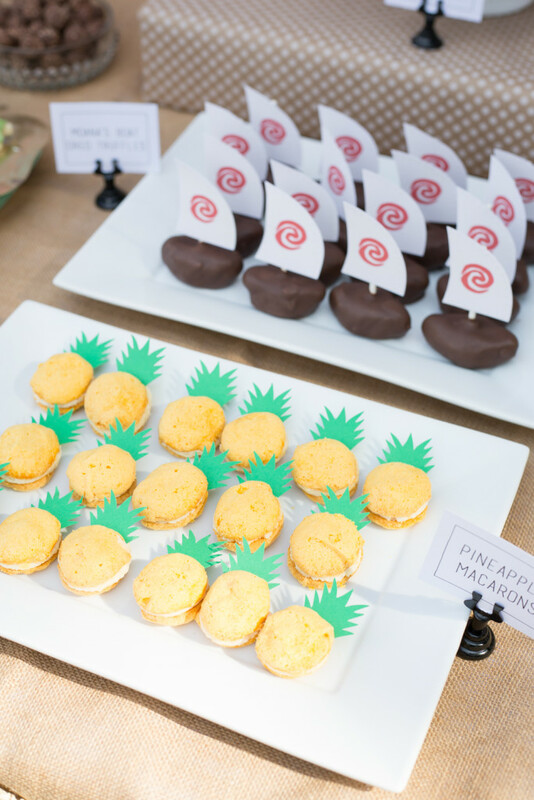 I cut out the little pineapple toppers with my Silhouette and stuck them in between the two cookies. 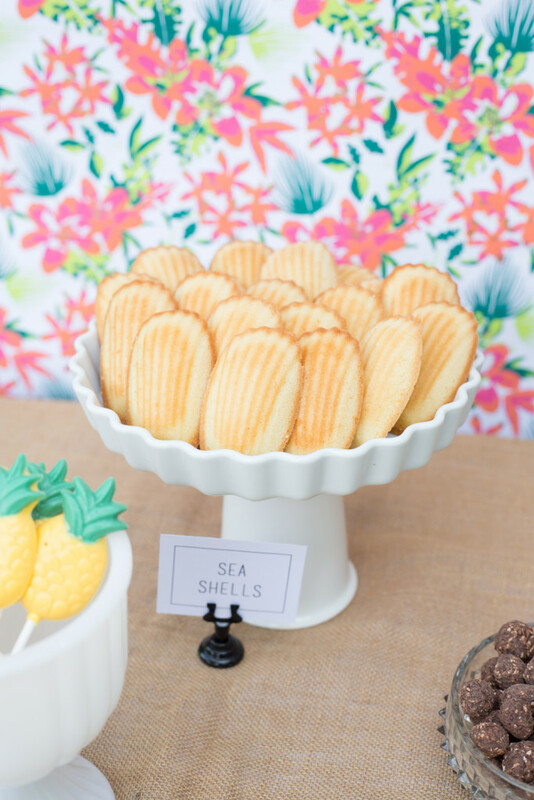 I grabbed some madelines from the grocery store and called them sea shells. 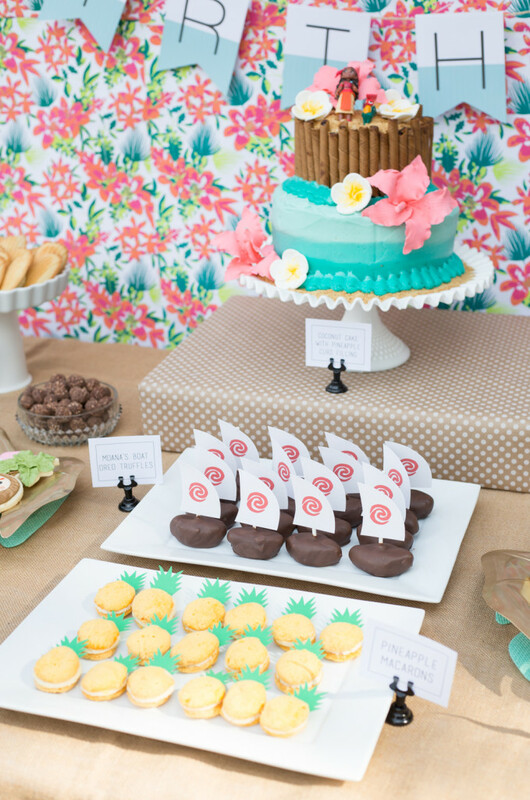 I just love using chocolate molds for my parties-they have SO many, and they can coordinate with a theme so well! 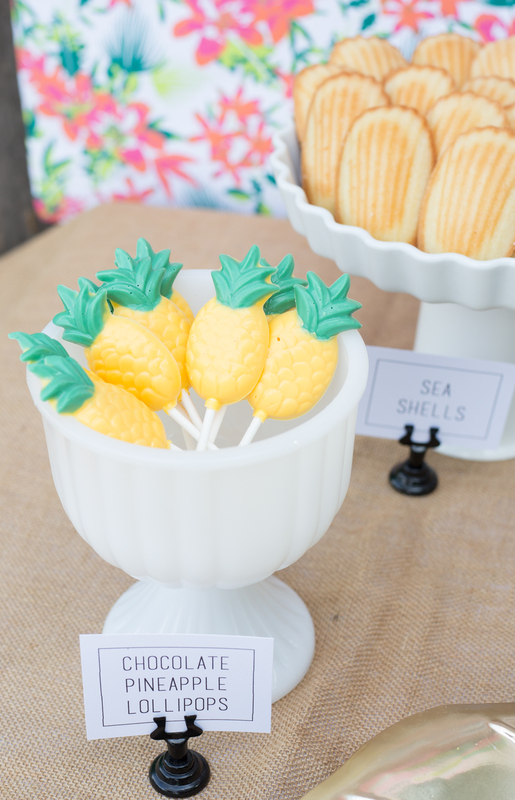 So these pineapple lollipops definitely fit the bill. here’s the cake! I baked a coconut cake with coconut frosting and pineapple curd filling, but now I can’t find any of the recipes I used. ha! blogger fail. I tried to do an ombre effect on the bottom, and if you look closely, you can tell! I also made some “waves” on the bottom, and sprinkled graham cracker crumbs along the bottom. I made some gum paste hibiscus and plumeria flowers that turned out pretty darn cute! I used some pirouli (?) 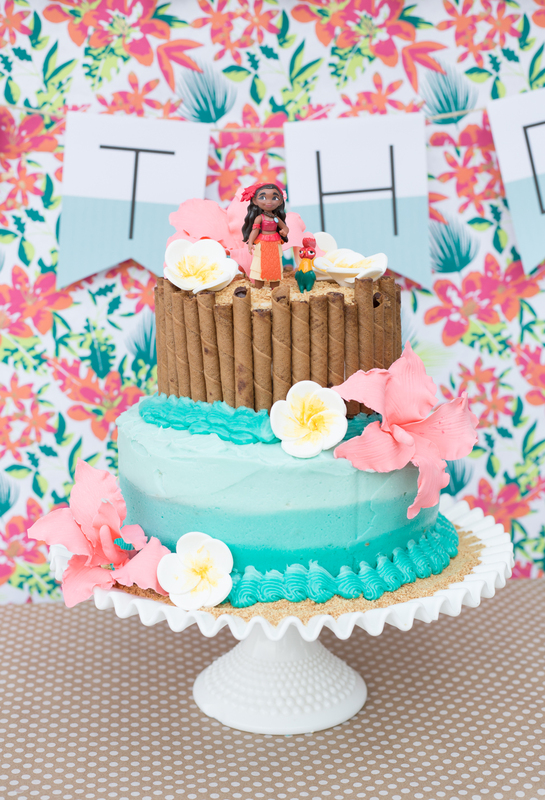 cookies to surround the top layer and posed a cute Moana and Hei Hei figurine on top! 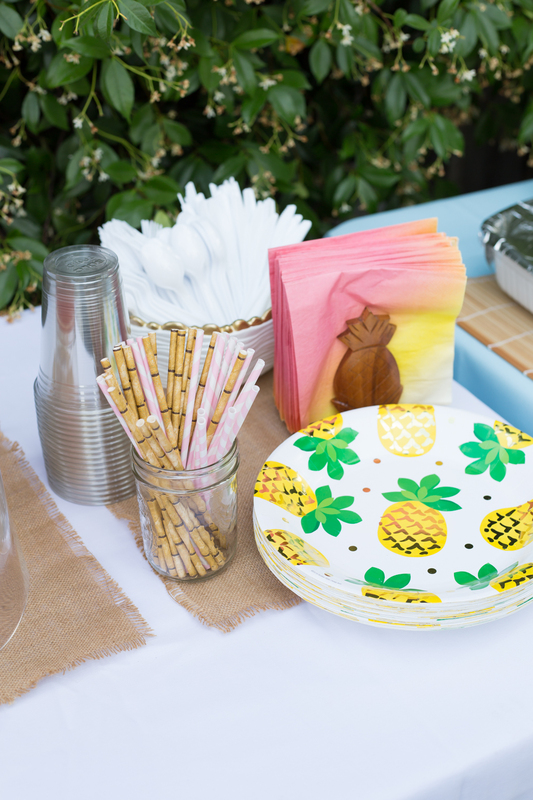 Loved these bamboo straws I found, and these pineapple plates I grabbed from Hobby Lobby were perfect. I thought the cute napkins I got looked kinda like a tropical sunset! word of warning-these were shipped to me in a one pack of 20, not 40 as it says-so I wrote to Amazon and they shipped me another. I don’t know if the listing has been updated though. 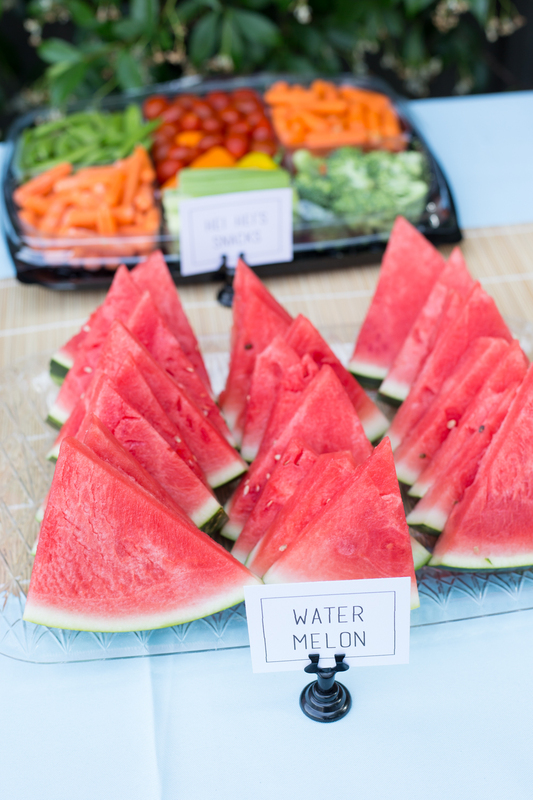 Served up some healthy Hei Hei snacks, and watermelon slices. 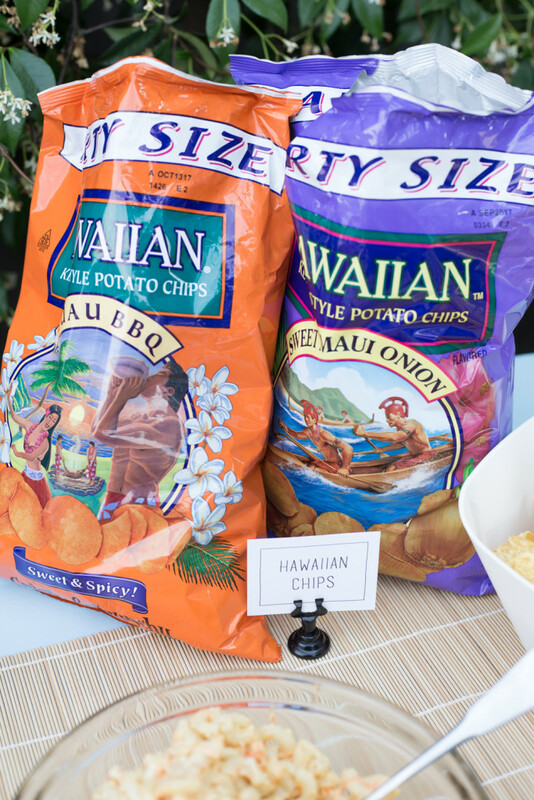 Of course, had to serve some of these YUMMY Hawaiian chips! 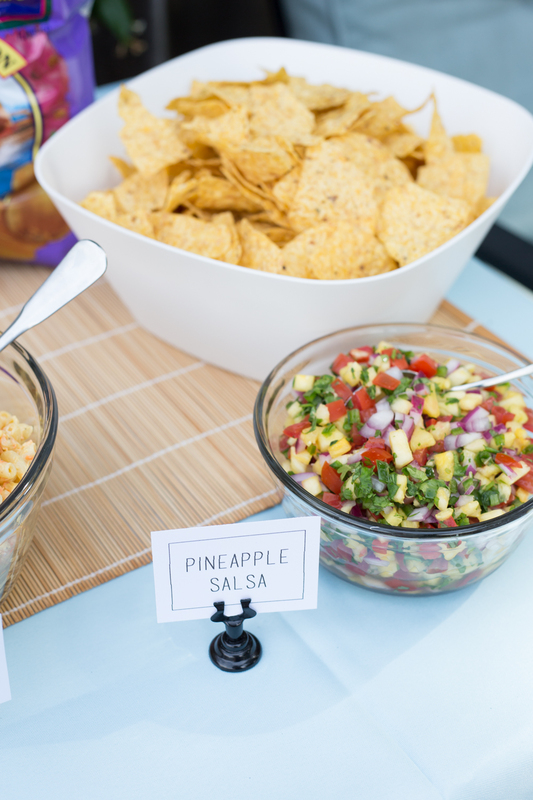 Also some pineapple salsa and chips! this was super popular and I wish I’d doubled the recipe! 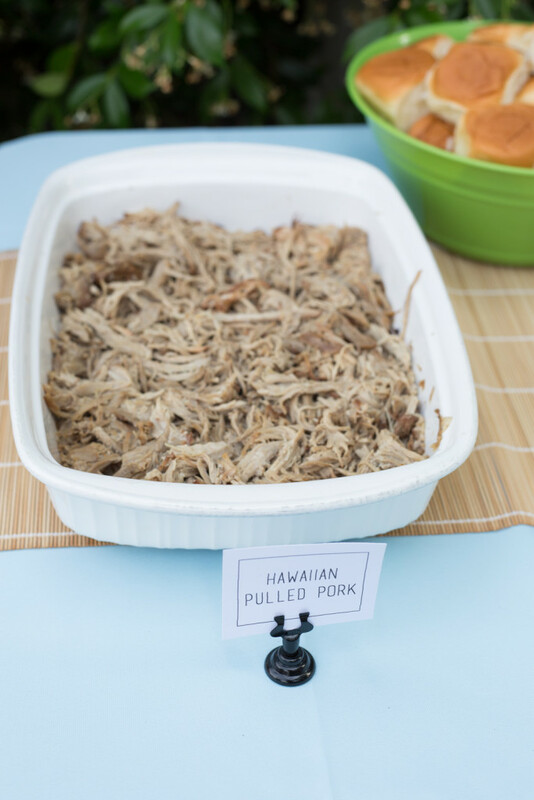 and pulled pork. 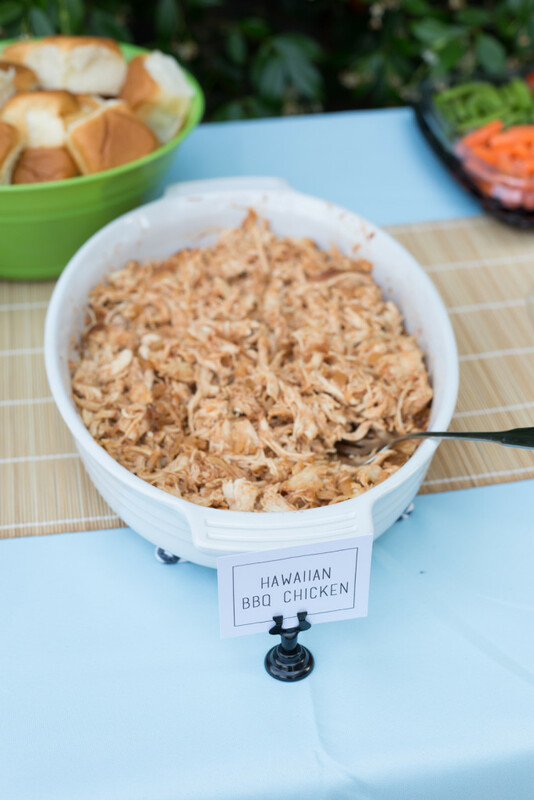 I of course grabbed some King’s Hawaiian rolls to serve sliders on! 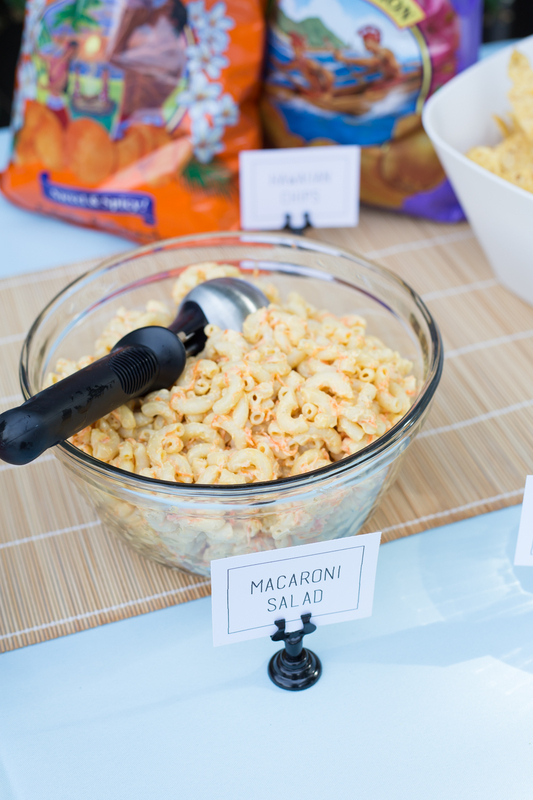 To round out the menu, some traditional macaroni salad served with a scoop, lol! 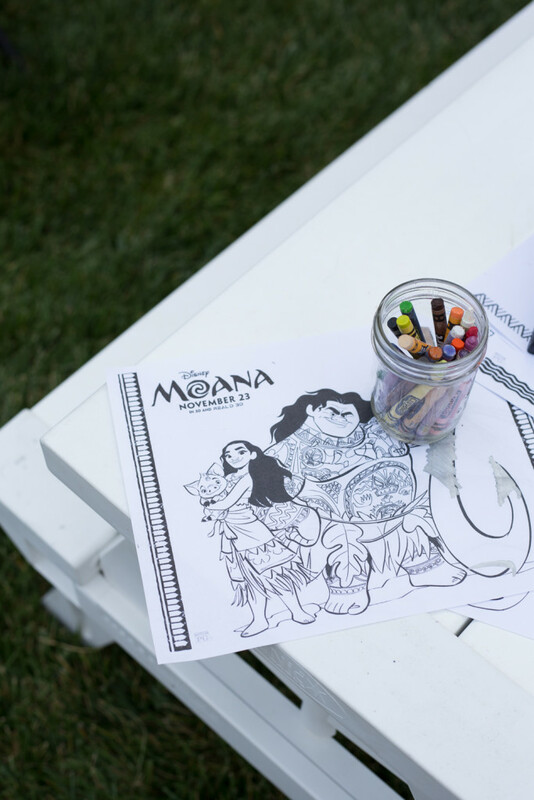 My go to party tricks include printing off free coloring pages to fit the theme, and having Rory blow up the bounce house for the kids. We’re pretty easy going in that regard, LOL! Super cute, of course, as or usual! 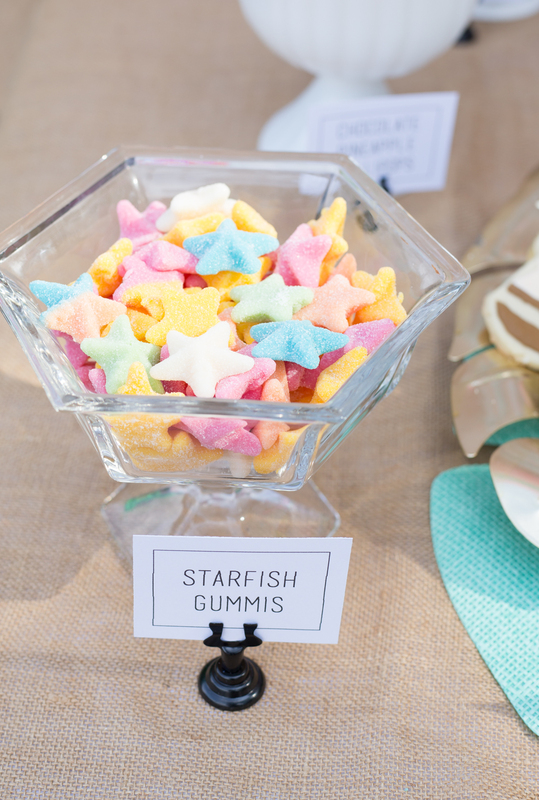 I never have the energy or organizational skills to pull off themed parties like this for my kids, but I always enjoy seeing yours. I think those things you used on Charlotte’s cake are called Pirouline. That was supposed to be “as PER usual.” Sigh. yes!! thank you for the cookie name! thanks! I think she may have bought it at Joanns? Thanks for your response! So I’ve searched high and low at Joann’s and online and haven’t found anything similar.. Is there any way I could get you to bug your sister for the fabric source? I would be so so grateful! Omg awesome is the word I always love the way u pull off such great themed parties and all by ur self ???? u are a real inspiration …..